Creating the perfect chicken coop for your feathered friends is an important task. To help your chooks remain as healthy as possible, you need to create an environment for them where they will feel safe, yet can roam around freely and not feel cramped in. A happy, healthy hen will produce much better eggs than a sad and unhealthy one. 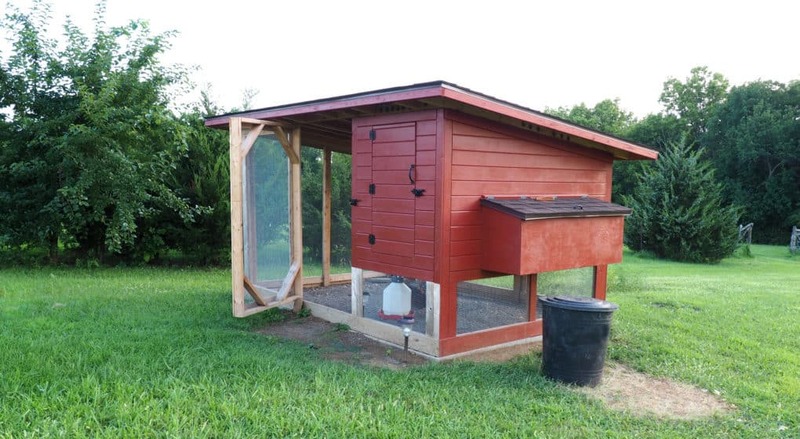 In this article, we’ll take you through some of the things to consider when choosing the best chicken coop kit for you. It will also show you some of the most popular kits available to buy right now and as well as a brief rundown as to why (or why not) they’re worth purchasing. This is the most important aspect to consider when buying a chicken coop kit as you need to ensure your hens have enough room to move around freely. It’s recommended that every bird should have at least 4 square feet of space within the coop. And if you have any plans for adding more birds in the near future, you’re better off choosing a larger coop now. The more overcrowded a coop is, the more difficult it is to maintain and keep clean. Roosting perches should be around 4 or 5 centimeters wide, and the chickens should have at least 3 feet of height clearance in which to jump around and ruffle their feathers should they want to. While chickens are pretty good at adapting to different climates, even they need shelter in times of extreme weather. Chicken coops that are made of wood are usually waterproof in their own right. Any that aren’t often keep the rain at bay using some kind of paint that repels water. Having a chicken coop that’s easily accessible is another important factor as it will make your life a whole lot easier when cleaning. Coops with a sloped floor are really good as the water can just flow out on its own accord. As are those with large doors. Some even feature removable dropping boards that help make cleaning hassle-free. There are many different chicken breeds, all of which have their own requirements. Some are quite content with living in confined spaces, whereas others need lots of room to roam around. Be sure to know what your birds need to stay strong and healthy. The most common materials for chicken coop structures to be made from is wood. That being said, the type of wood that’s used can vary quite significantly. Both cedar and fir wood are popular choices as they’re both pretty solid, but you will notice a number of other types of wood used depending on the manufacturer. Some commercially available chicken coops are made from timber and plastic. Plastic is good to use as it’s lightweight, easy to clean and dries quickly compared to wood which can take hours to dry. Plastic is also much smoother than wood so there’s less chance of pests finding somewhere they can hide inside. The main problem with plastic chicken coops is it’s harder to regulate the temperature inside them. So it’s often too hot in the summer and too cold in the winter. It’s also harder to repair plastic if it gets damaged. Depending on where you live, your chickens may be at risk from predators such as cats, hawks, coyotes, or even bears. Be sure to analyze what predators may be lurking and adjust your security accordingly. Not all predators have the same strengths and weaknesses. But once you know what you’re dealing with, you can easily protect your birds from whatever critter is posing a threat. Putting a latch on the door will help in certain circumstances, but it may not be enough to keep some of the more determined predators away. If you have a wooden floor some predators may simply tunnel underneath, so you may want to consider putting some mesh down also. The time it takes for you to completely assemble your chicken coop will depend on two things: how complicated the design is, and your DIY skills. If you’ve opted for something quite simple and you’re a handyman by trade, then happy days! You’ll have it put together in no time at all. If you’ve chosen a very intricate design and don’t know a screwdriver from a chisel, then you may have a longer day ahead of you. So, choose wisely. Just like you and me, chickens need fresh air to remain healthy, so good air circulation and ventilation within your coop are essential. Not only will ventilation allow the strong smell of ammonia produced from the chicken droppings to escape, but it will also prevent condensation within the coop. A vented chimney is a simple yet effective way to do this. Chickens tend to sleep at the highest point within their coop. This comes from the natural instinct of perching on the highest branches in trees. So, for that reason, make sure your perches are placed as high as possible, above the nesting boxes. Never overcrowd your chicken flock. There should be at least one nesting box for every three chickens. And it should be easily accessible for the birds at any time. To help keep your hens as healthy as possible, coop floor bedding needs to be changed on a regular basis. Having pull-out cleaning trays make this job a whole lot quicker and easier. Chicken’s like to play too, you know. And, one of the things they enjoy doing is swinging. Simply hang this in your coop and watch them swing their little hearts out. Allowing your chickens to roam freely is essential for keeping them both physically active and mentally stimulated. Poultry fencing is easy to attach to most coops and can be moved around as often as you need. Chickens get a little excited when they eat and as a result, they often knock over their feeders and make a mess. However, a treadle feeder is an accessory that helps prevent spillage in this way as well as keeping out those unwanted pests. 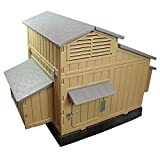 To help make purchasing your next chicken coop kit a little easier, the following reviews are a quick rundown of some of the most popular options available right now. Big enough to be a home to 4-6 large chickens, this extremely durable coop on offer from Formex is by far one of the best we’ve seen in a while. Made from double-walled plastic, this is one tough coop. It’s water resistant, UV resistant, and chemical resistant and lockable to keep any naughty predators at bay. If you’re worried about ventilation, don’t be. This Formex Snap Lock chicken coop was designed to have adjustable ventilation to ensure your birds remain comfortable in all kinds of climates. Assembly is minimal and you don’t even need any tools. Simply snap the parts together to get a solid structure, pop in the litter tray, add the nesting boxes, and voila! Made from beautiful fir wood, and finished in an auburn and white color, not only does this chicken coop look the part, but it also serves its purpose very well too. Its black asphalt roof is both durable and waterproof and keeps your birds dry in the rain, while the strong wire mesh keeps any lurking predators from getting in. There’s a complimentary steel slide pole in which to easily control the adjoining door between the ramp and resting area and the bottom tray pulls out for easy cleaning. At 71” x 28.5” x 48” it’s quite roomy, both inside and out, and despite its big size, it’s actually quite easy to put together. Let your chickens relax in style with this gorgeous chicken coop on offer from Pawhut. By far one of the best looking models out there, this chicken coop is made from high-quality, weatherproofed, fir wood, offering both durability and strength. It’s elevated design prevents the nesting box from becoming damaged in wet weather. 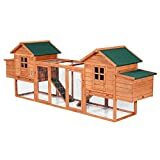 The dual nesting boxes and spacious outer run provide plenty of space for up to six standard size chickens. And the sliding ramps, roosting poles, doors, and tray are all removable to allow for easy cleaning. 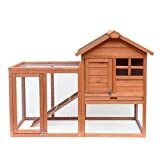 If you’re looking for a chicken coop that’s well made, looks tidy, and is so very easy to use, then be sure to check out this model from Best Choice Products. 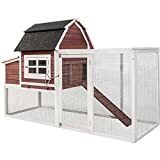 Made from a traditional rain-resistant fir wood, and metal wire fencing for security around the run, this coop is the ideal environment for housing up to for standard size chickens. The way it’s been designed allows you easy access to any part of the coop, including a hinged roof, which makes cleaning a breeze. There’s a slide-out door ramp to help your birds enter the nesting box and a metal locking system that keeps them safe once inside. If you’re planning to increase the number of chickens you have any time soon then you may want to consider the Creative Coops Hen House Starter Kit. Initially, it’s designed to house 6 standard sized chickens, but because of its modular design, this can easily be extended at a later date. The parts seem to be of pretty decent quality and the design is ok, although it is a little on the small side. However, there are many problems with this coop. Firstly, there are so many parts to it that assembly is a nightmare and could literally take you days to finish. The second issue is that it looks so plain and boring. And the third issue is that considering all you’re actually getting for your money, it’s pretty darn expensive. So, as you can see from the above, chicken coops vary quite a lot in terms of size, color, and what features they have. 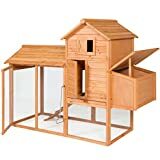 As a quick reminder, the best chicken coop kit we’ve seen around for a while is the Formex Snap Lock Large Chicken Coop Backyard Hen House. It may be the only one on the list made from plastic, but it ticks all the right boxes. It’s big and sturdy, easy to assemble, and even easier to clean. And, with adjustable ventilation, there’s no concern over your chickens getting too uncomfortable either. Whatever coop kit you decide on for your chickens, the main thing is to make sure it’s big enough and airy enough. Just remember that healthy chickens produce the best eggs.